Joe Denly says he has unfinished business at Kent after returning to the club where he started his career. The 28-year-old batsman re-joined his home county this week following a three-year spell at Middlesex. "I always thought, when I signed my first contract, I would play my whole career here," he told BBC Radio Kent. "Unfortunately that didn't work out but I had a great few years at Middlesex. I feel like this is my home club and I really want to do well." He continued: "Kent have given me a lot and I learned my trade here. I want to try and get them back up into Division One (of the Championship) as I think we are a club that certainly belongs there." "Trying to get back into the Kent team, with competition for places very strong, there are no guarantees. I have got a big winter in trying to get myself right for the season." Denly was only 18 when he made his debut for Kent in 2004, and the prospect of a return to his home county was first mooted at the end of the 2013 season. "When I left, it was a very tough decision. I always thought whether I'd get the chance to come back and play here again and finish my career here," he said. "I suppose towards the end of last summer is when we started talking and when it started to become a real possibility. I'm delighted it has happened. "Just thinking about being able to put the Kent shirt back on is exciting. It will be a good moment." 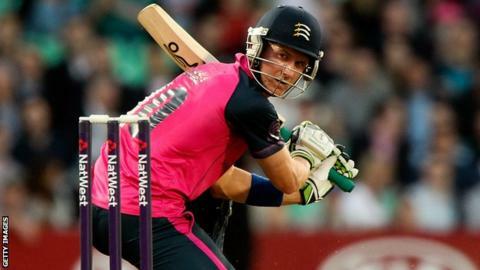 Denly had a disappointing season this year, scored 327 runs at an average of 23.36 in nine County Championship appearances for Middlesex in 2014 and 209 runs at 19.00 in the T20 Blast competition. And he is now looking to re-establish himself at Kent as a first step towards trying to revive an England career that saw him play nine one-day internationals and five Twenty20 matches between August 2009 and February 2010. "I'm still only 28 and feeling pretty good and fresh. I'd love to play for England again but that is not my main focus at the minute. "Trying to get back into the Kent team, with competition for places very strong, there are no guarantees," he added. "I quite enjoy batting in the middle order in red-ball cricket, but I don't know what plans Kent have. Daniel Bell-Drummond did very well last year and Rob Key has been a great servant to Kent for a number of years at the top of the order. "In white-ball cricket I like to be as close to the top as I can, but we'll have to see. I have got a big winter in trying to get myself right for the season and to get myself in the first XI for that first game."